The most effective software in the world won’t do you any good if it’s difficult to implement or it doesn’t work with your existing systems. Our web-based, user-friendly software offers easy integration with your existing ERP, CRM, financial, and other systems through web services. Integrations have become a standard part of our implementations and as such, we have integrated with all the major ERP systems on the market – and some that you may have never heard of! Integrations are part of our DNA, and something we do well whether we are implementing a single Synchrono® system or many systems under the Synchrono Demand-Driven Manufacturing Platform. 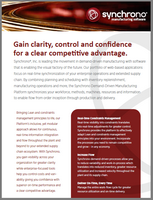 The Synchrono Demand-Driven Manufacturing Platform is testament to our integration experience. Under the Platform, we connect Synchrono systems along with your machines and other enterprise systems. All your manufacturing layers – your workforce, materials, machines, method and information – is all synchronized, in real time. Now that’s integration that matters. To integrate our proven, demand-driven software with your systems or to learn more about Synchrono, contact us today.